Sport fishing in Alaska is famous, whether you are an ardent fly fisherman or prefer spin casting. Both the crystal clear streams and the glacial silt rivers are home to abundant fish. Five species of salmon load up the streams and rivers and lakes are home to trout and pike. Fly fishing and ocean fishing is a mecca experience for many visitors. next » | 116 sample images from this category. Try a keyword search to see them all. King salmon charter fishing from a small charter vessel in Sitka, Alaska. King salmon charter fishing in Sitka, Alaska. Man fly fishing on the Chatanika river, Interior, Alaska. 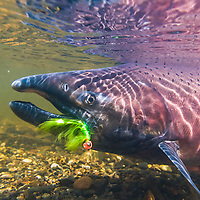 Rainbow trout caught on a fly in Red Creek, south of the Alaska rage. Fly fishing on the Chena river, Interior, Alaska. Naknek Lake, salmon fishing, Katmai National Park, Alaska.